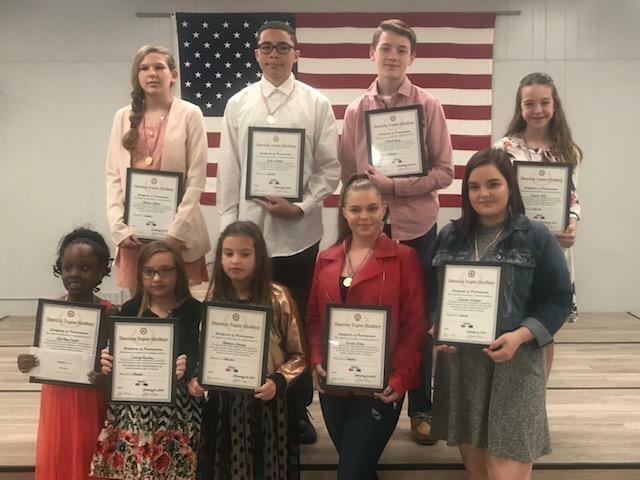 Belmont Academy’s best writers placed at the top in the county, earning cash and recognition at the American Legion Auxiliary banquet, January 19th, for their exceptional essays on veteran homelessness. All sixth to eight grade students participated in the annual American Legion Essay Contest by writing essays to show support for American Vets. The essays focused on how we can prevent or address veteran homelessness in America. Belmont middle schoolers shared several ways to help homeless vets including providing drug prevention programs, assisted living projects, as well as job placement opportunities. Overall, students demonstrated compassion and concern for America's veterans by writing to promote awareness of veteran homelessness in the United States. The American Legion Auxiliary sponsors this contest annually and generously awards prizes to the top three essay writer in six competing groups. Five Belmont Academy students won in their competition category. Vanessa Todd placed first in the county for the fifth and sixth grade students, winning $100. Neel Patel, competing in the same category, placed third and won $50. In the seventh and eighth grade category, Belmont eighth graders took all three prizes! Madison Allison won first place and received a $100 award. Samuel Kurtz, placed second and earned $75. Kevin Williams took third and earned $50. Belmont middle school, social studies and civics teacher, Apryll Tillotson, is impressed with the character and writing abilities of Belmont’s students. “We are very proud of each of our students for participating in the Essay Contest, and are thrilled that so many of our students were recognized by local leaders for their excellence in writing and patriotism,” said Tillotson. Winning sixth grader, Vanessa Todd, was excited about her win and enjoyed discussing her tiny houses for veterans concept. “I was very excited about winning first place. I was a little nervous about reading my essay in front of the crowd, but after I got going, it was easy to talk about building a tiny house community to help with homelessness among veterans,” said Ms. Todd. Another winner, Madison Allison, was surprised by her win, but is happy that the judges liked her ideas on how to advance veteran programs. “I thought it was cool that I won first place.” She laughs, “ I did not expect to be a winner! I just brainstormed ideas and came up with ways to make advancements on the existing programs that help Veterans. Things like therapy for veterans and their families and ways to make it easier for vets to get the help they need without having to wait so long and fill out tons of paperwork,” said Ms. Allison. Belmont Academy would like to send a thank you to all the students who participated in the essay contest as well as congratulations to all the winners. We would also like to extend a huge thank you to the American Legion for sponsoring this great contest. Thanks for reading and check in again next week for more exciting news!